And with these words, spoken by my regular (well, since the start of August) Wednesday night squash partner, the seeds for an extra – bonus – groundhopping adventure were sown. A moment’s pause. He may have been contemplating my offer. He may have been weighing up quite why I knew that Bexhill were due to be playing Southwick on a random Wednesday evening. Who knows? Anyway, after a little consideration he decided that he did indeed fancy a trip to the football. So, this Wednesday evening, at a time when we should have been charging (well, probably not charging, more... ambling) around a squash court trying to burn off some unwanted calories, we were instead sharing a couple of pints in Southwick’s clubhouse. Oh well. Best laid intentions and all that. 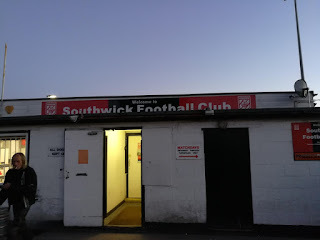 Now, some of the more eagle-eyed among you may have noticed that I’ve mentioned being in Southwick’s clubhouse, despite the fact that Bexhill are listed as the home-side in the above score-line. This is not an error – perish the thought. 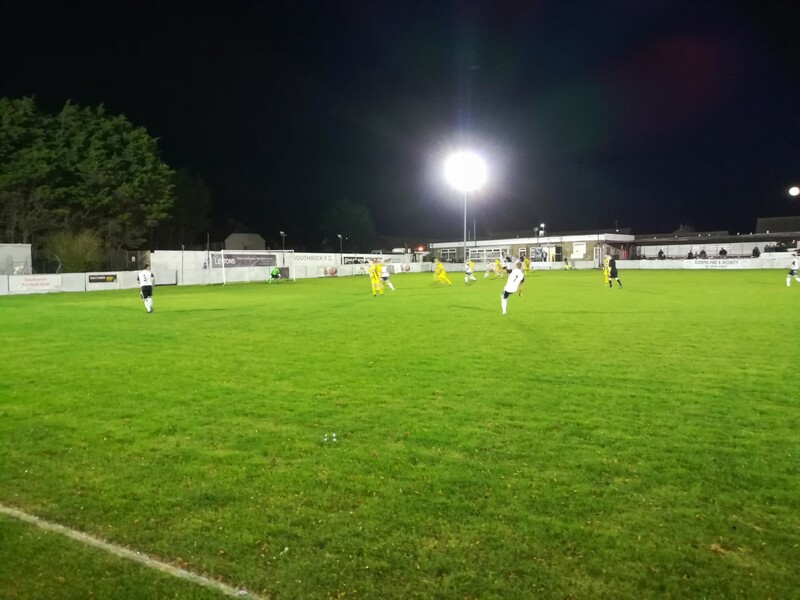 The game was switched on Monday due to ongoing groundwork at Bexhill’s home ground, so although this match was played in Southwick it officially counted as a Bexhill home game. It had been the announcement of this switch on Twitter that had initially alerted me to the fact that this game was being played. Despite what my friend may think, I don’t have Rain-man like abilities when it comes to Sussex football. Although, admittedly, I am getting there. Due to the fairly last-minute change in venue there was no hot food being served at the game, much to my companion’s chagrin. He was starving. Instead we consoled ourselves with a packet of pork scratchings (me) and some bacon fries (him) and resolved to head to the closest McDonald’s drive-thru after the game. Unfortunately, on this latter mission my friend proved himself to be rather less reliable than a SatNav, and a quick tour of Southwick and Portslade followed. Unlike U2, we did eventually find what we were looking for. Anyway, back to the game. 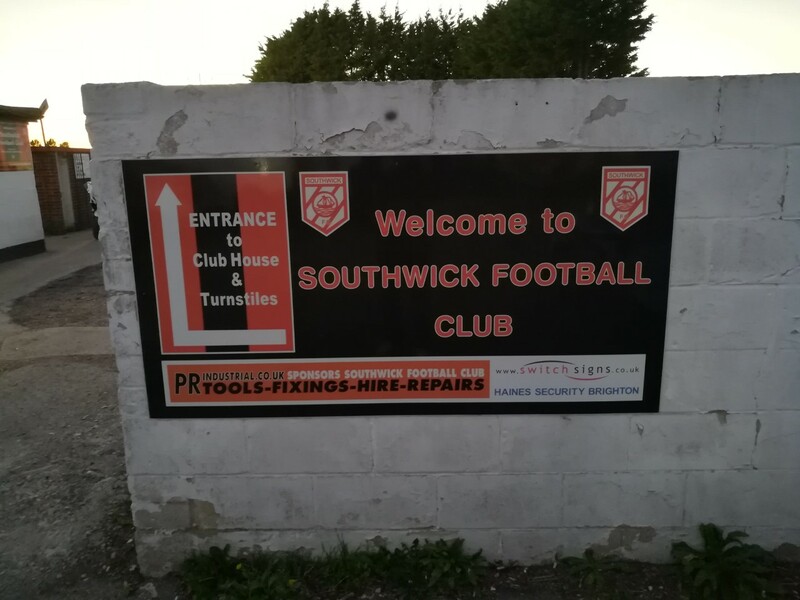 Admission to Southwick’s Old Barn Way Stadium was just £5 a person, with a hastily put together program thrown in for free. 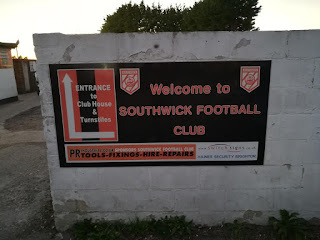 Admittedly, I’ve been quite spoilt with some of the grounds I’ve visited recently, and don’t think I’d be unjust in saying that Southwick’s ground is one that has probably seen better days. That’s not to say there’s anything wrong with it. It’s certainly no worse than a lot of grounds at this level. The main stand looks nice enough, and the padded seats for added comfort were a nice touch. It just looked a little… well… shabby in places. Unfortunately, as is the case for thousands of non-league clubs up and down the country, money is an issue. As hard as volunteers work they can’t do everything. In my opinion it is clubs around this level throughout the nation where the FA should be providing far more funding as a little (relatively speaking) can go a long way. The first half of the match, as the league table had suggested would be the case, was one-way traffic, with high-flying and free-scoring Bexhill utterly dominant. They took the lead with pretty much their first real attack of the first-half, when Jack Shonk scored a delightful effort with the outside of his boot from the edge of the area on the 11-minute mark. Ten minutes later it was two. Sammy Bunn finished off some really good interplay, which resulted in a clever lay-off from Wayne Giles and a driven strike from 20 yards. It was possibly the best worked goal that I’ve seen so far on my travels this season! 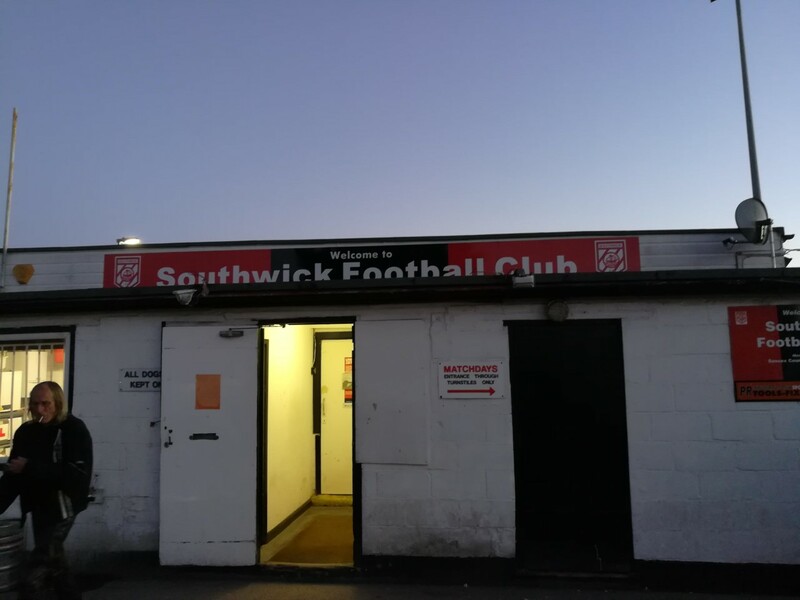 The rest of the half played out like an attack vs defence drill, with Southwick forays into the Bexhill half as rare as a Jose Mourinho smile. Yet Bexhill could not find a way through for what, I’m sure, would have been a decisive third goal. Potentially a goal that would have opened the floodgates for a real hiding. The second-half was a complete contrast from the opening 45 minutes. 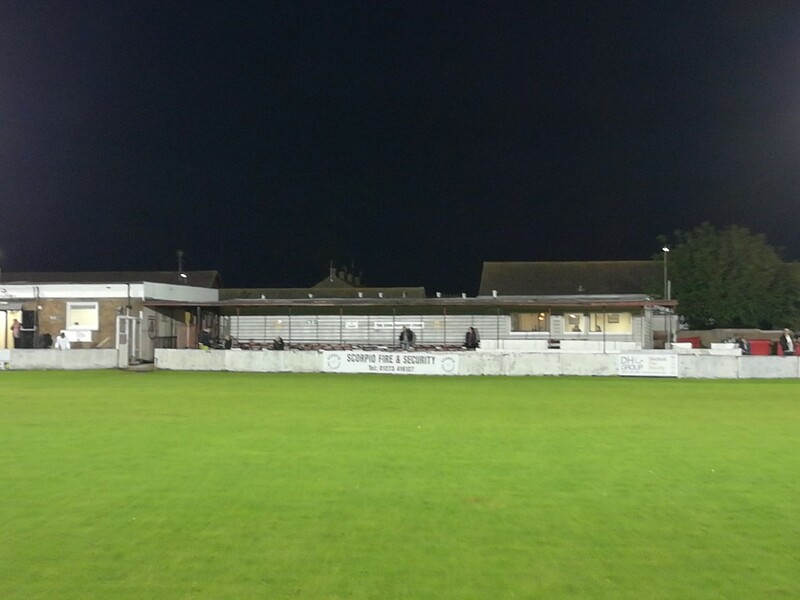 Whether it was a case of Bexhill thinking the game was won and taking their collective foot off the pedal, or some unbelievably motivational words coming from the Southwick dressing room during the interval, the visitors (who were playing at home) suddenly began to have the upper hand. 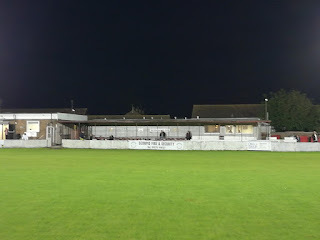 This was much to the annoyance of my friend and I, who had moved to the other end of the ground, expecting most of the action to take place in the end Bexhill were attacking. That’ll teach us for being presumptuous! Were it not for three superb saves from Bexhill goalkeeper Daniel Rose, and a headed clearance off the line, the outcome of this game could have been every different. This isn’t to say The Pirates didn’t threaten sporadically. They did have the ball in the net around halfway through the second-half, following a goalkeeping error, only for the assistant’s flag to rule out a third goal. So it finished 3-0 to the hosts/visitors. Let’s just say Bexhill. All that remained now was a trip to McDonalds to top up on our pint and bar snacks. Let’s hope my friend’s injury doesn’t last too long. I’m not sure my waistline could take it!